As educators, we know so much and yet we have so little opportunity to put our experience and knowledge to use in support of others – particularly our colleagues. Last week Brenda Augusta, Sandra Herbst, and I had the opportunity to work with a packed room for a one-day institute focused on facilitating adult learning. 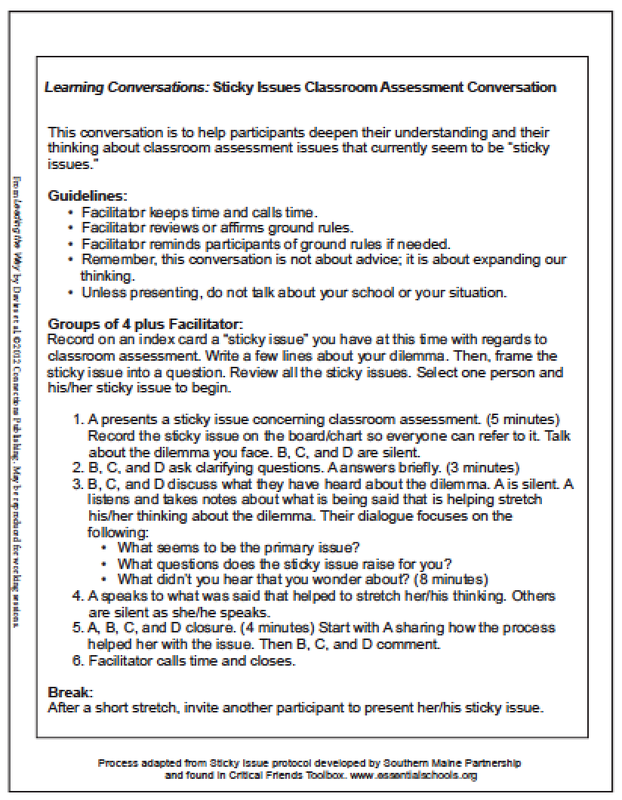 One of the strategies we shared during a break-out session is the Sticky Issues Protocol*. The participants who kindly agreed to demonstrate the protocol in a ‘fishbowl’ setting for the rest of us were so engaged as was the audience! I also appreciated the positive response. Everyone saw immediately how useful the protocol is for surfacing craft knowledge and providing amazing support for adult learning. Afterwards, a couple of people shared how the use of protocols has totally changed the adult learning culture in their schools. And, how some teachers are now using protocols with students. I know that is also true in the schools where Catherine Glaude, author of Protocols for Professional Learning Conversations and When Students Fail to Learn works. The process for the Sticky Issue Protocol is simple. Provide some time during department, grade-level, learning team, and faculty meetings for colleagues in groups of 5 – 6 people gather to share ideas and experiences with regards to any dilemma connected to our work – it may be a challenge surfaced by a student or group of students, parents, curriculum challenge, and so on. After the protocol has been taught and practiced it is important to build it in as an ongoing routine. · Briefly review the agreed upon Norms of Collaboration. · One person agrees to keeps time. · Then, the person presenting the dilemma describes it in two or three minutes (or less). · The four or five people in the group listen and ask questions for clarification. · Then the person presenting the dilemma pulls back from the group and the remaining members close in the circle. Without taking or assigning ownership of the ideas, the group members talk through possible responses and ways of thinking about the issue. The person presenting the dilemma listens carefully and takes notes. · After 8 – 10 minutes, the presenting teacher rejoins the group and talks about what she or he heard that will be taken away to reflect upon further and/or to use. · And, by way of finishing, participants reflect on what they learned, thought about, and suggestions they might have for the future use of the protocol. This powerful yet simple protocol provides time for the deliberate sharing and accumulation of craft knowledge. I remember teaching this protocol to a group of principals. In one of the groups a brand new principal shared a ‘sticky issue’ related to a student with a challenging education plan. The ideas that burst forth from his colleagues filled pages and pages as he listened. I’ve seen the same thing happen over and over again as people use this protocol. As educators, we just don’t know how brilliant we are! The complete step-by-step directions can be found in Leading the Way to Assessment for Learning: A Practical Guide (described on page 71 and found as a reproducible on page 166 of Appendix 2). You can find the Sticky Issues Protocol along with classroom video clips and practical ideas on our free members site. * This protocol is adapted from Sticky Issue protocol developed by Southern Maine Partnership and found in the Critical Friends Toolbox.